On the 21st March, a team of 12 Enthusiastic Club Members set out to journey to the NEC in Birmingham to display 5 ‘Rare and Unusual Rovers’ for the Club at the Practical Classic Restoration Show with Discovery 2019. This is now the club’s 4th invite to display at the show. 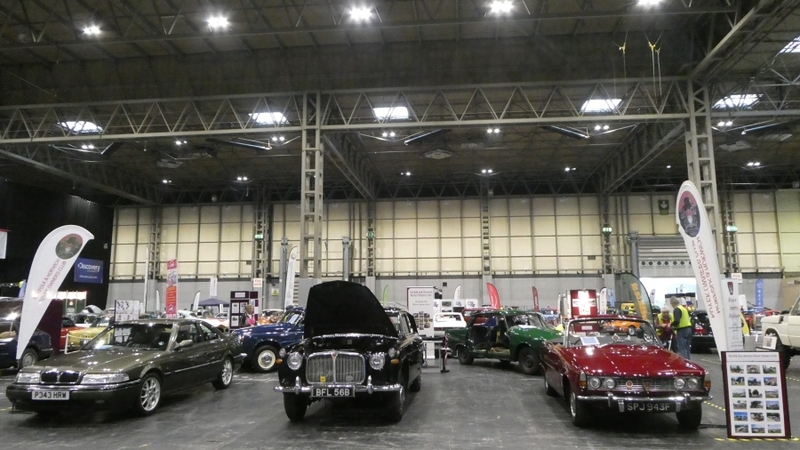 Our largest stand yet, at 10.5m x 11m was to display the stunning cars generously volunteered to fill the space. The display included ….. a 1957 Rover 90 P4 Utility Vehicle, 1964 Rover 3lt P5 Hearse, 1967 Rover P6 Open Top, 1978 Rover 2200TC P6 under full restoration and a 1996 Rover 825 Limited Edition Sterling V6 Coupe. The team arranged the vehicles, our new club notice boards crammed with information, a table with club advertising leaflets, along with our club flags and banners and prepared for a busy 3 days. The public interest did not disappoint, with some of the 28,800 visitors stopping to admire all the cars on our stand, ask questions and get more information about our Rare Rovers. Being only one of 170 National Car Clubs present at the show. 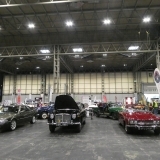 In the true Restoration Show spirit, 3 of our members took time to complete some light maintenance tasks while at the show. The P4 owner is currently restoring the interior and removed his passenger seat to apply several coats of leather balm to make the seat supple and prevent the leather cracking. Our P5 Hearse owner has brought a box of items to fit to his car, and over the 3 days raised the hearse up onto axle stands and fitted 2 front brake calliper’s and shock absorbers to the car. Our 1978 P6 owner raised his car onto axle stands to fully refurbish the hub and brakes, on dismantling the brakes, he realised that he needed some new parts, so with over 350 exhibitors at the show he went shopping, although he came back with the bits he wanted, he also came back with other items that he hadn’t realised he needed! Our stand had visits from some lovely people, some kindly signed our visitors book, along with several Club members too, who braved the long journey to the NEC to support the Club. We provided a Members Enclosure with seating and enjoyed a chat. The Committee would like to Thank the Team and the Rare Rover Owners who displayed their Cars. Plans are in motion for 2020, so if you are a member and you are interested, Please contact us.